When discussions at Studio 11 come up about effects and reverb (ya we’re tech geeks), we find ourselves always talking about our Intersound PRV-1 Para EQ/Reverb module. 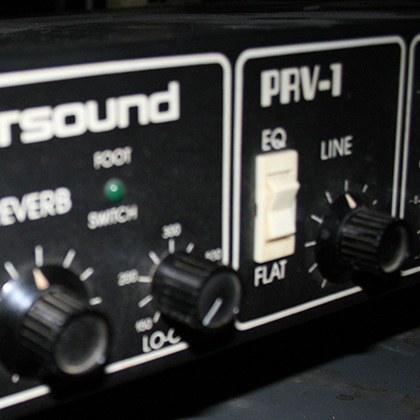 First built in 1981 and sold up until 1985, the Intersound PRV-1 Para EQ/Reverb was considered a must have spring reverb by many audio engineers back in the 1980’s. Although not as clean as the AKG BX Series spring reverbs, the Intersound PRV-1 possesses a character and quality that is unique to any other spring reverb effects unit. Nowadays, it is considered an extremely hard reverb unit to come across. The Intersound PRV-1 is a mono spring reverb unit. It has 2 inputs (unbalanced XLR & TRS quarter-inch socket) and 2 outputs (unbalanced XLR & TRS quarter-inch socket). Power is interfaced via a 120VAC connection. For all you guitarists, there is a socket for a foot switch pedal in the back of the unit as well. Starting at the left side of the front panel of the unit, the first control in the signal path is an input attenuation offering ±18dB range. 4 separate associated LED lights located next to the input knob indicate various stages of input gain. Next to the input attenuation are the control parameters for the reverb. The reverb knob controls the amount of signal passing through the springs. When the knob is turned left, no signal passes to the springs, and when the knob is turned right, full signal passes through to all the springs. The reverb section also features lo cut equalization control with a range of 150Hz – 1.2kHz. A white button next to the reverb, labeled ‘EQ & Flat’, allows the user to engage or bypass lo cut equalization control. To the right of the reverb control is the specially designed parametric equalization section with two sweep equalizer controls stacked on top of each other. Each parameter is equipped with a boost/cut control providing ±14dB range. A white button to the left of the parametric controls (labeled ‘Flat or EQ’) bypasses or engages the equalization section. Each of the two swept equalizers provides an adjustable bandwidth knob adjacent to each frequency control with a range of up to 3 octaves. The low sweep covers a range between 80Hz-1.8kHz, pleasantly sharing an overlapping octave with high frequency sweep which covers a range between 500Hz-12kHz. At the far right hand side of the Intersound PRV-1 is the power switch and output attenuation control. The output has a range from infinity to +9db. With the invention of convolution reverbs 10 years ago like Altiverb and TL Space, it is now possible to find impulse responses of the Intersound PRV-1 that emulate the sound of its springs. Though some of these impulses responses may sound like good representations of the Intersound PRV-1, they are not the real deal. What makes the Intersound PRV-1 so good is its springs, transitors, circuitry, fuses, and the electricity coming out of your outlet. True analog reverb, you can’t get that ‘ITB.’ So if you are looking for that sweet one of a kind sound for your guitar, vocal, or project, give us a shout. We always make time for analog.